I just pressed an organ – a liver, to be specific – through a sieve. How did I wind up as some poor chicken’s Hannibal Lecter, you ask? Well, a couple of days ago I decided I wanted soup. It’s getting chilly and I was looking for something (other than bourbon) to warm my tummy. I was flipping through The Gold Cook Book this weekend for Sunday Tips when I came across “Cream of Giblet Soup New England Style.” This recipe had 3 things which appealed to me: 1) an easy way to take on offal, 2) a reminder of home (there is nothing quite like hot soup on a cold New England night), and 3) this intro from Chef De Pouy: “This soup is very good and very inexpensive. 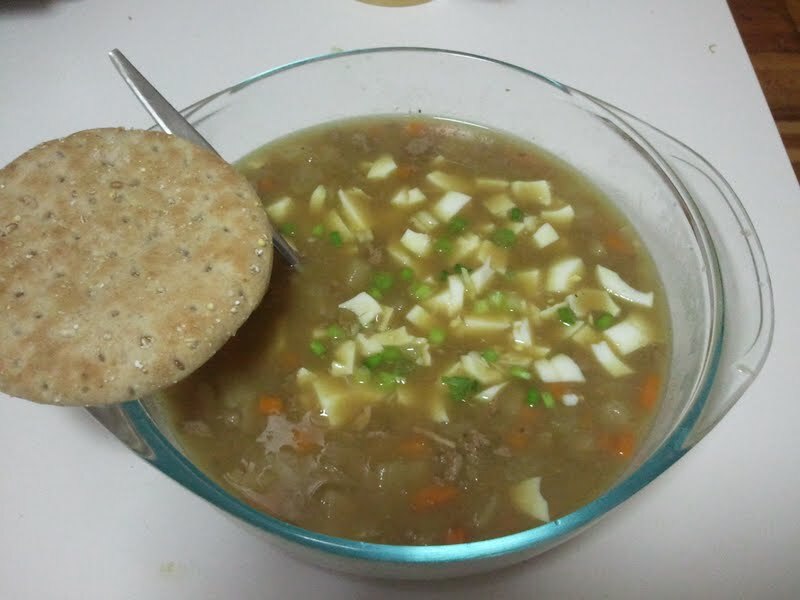 It is an excellent imitation of mock turtle soup.” I was intrigued by the especial blessing the Chef gave this recipe, and by the fact that it’s an imitation of an imitation. Today I finally made it to Whole Foods, where I thought I’d be able to find liver and giblets, the two “specialty meat” ingredients for this soup. Sadly, the store did not sell the latter ingredient separate from whole birds – so I got some chicken necks to flavor my stock and contented myself with making this experiment more about liver than giblets. Offal seems quintessentially vintage to me, so I was really excited to cook up some liver – even if it is kind of “offal lite.” I love reading The Nasty Bits at Serious Eats, so I was happy to take on some organ meats myself. A lot of vintage cookbooks have great offal recipes to make efficient use of expensive proteins. I’ll never be vegetarian, so I try to be a conscientious omnivore by being really willing to use as much of an animal as possible. This recipe was super-tasty – it had a lot of the same flavors as chopped liver, which I also love, and it was hearty and filling. It was also, as Chef De Pouy pointed out, very inexpensive. I’ll definitely be hunting some gizzards down and trying this again! 1. Wash, pat dry, and chop the gizzards and set them aside. Chop the carrot, turnip, and onion and saute in a medium saucepan (the 3 qt. one I used worked perfectly). When the vegetables start to brown a little, add the gizzards and cook for 2-3 minutes. Sprinkle with 1/2 tbsp. flour, mix well, and add the boiling water. 3. Toward the end of simmering time, press the livers through a fine sieve to yield a kind of liver paste. Make a light brown roux with the 1/2 tbsp. butter and the second 1/2 tbsp. of flour. 4. When simmering is done, add the liver paste and roux to the soup and cook, stirring well, for about 3 minutes. 5. Pour into serving bowls, sprinkle with the egg and parsley, and serve with freshly toasted bread. **As above – I used 2 chicken necks instead of gizzards. These yielded a nice stock after 1/2 an hour of simmering, instead of 2 1/2 hours. I took out the necks after simmering, ran them under cold water to cool, and pulled off what meat I could to add it back into the soup. It sounds good. I too need something other than bourbon to warm me up now that it is getting cooler. Also, don’t they sell giblets at Westside?